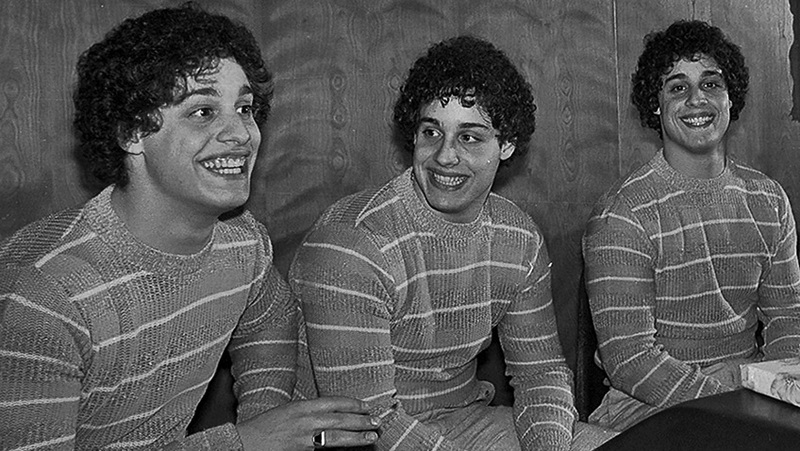 Joyce Glasser reviews Three Identical Strangers (November 30, 2018), Cert. 12A, 96 min. Tim Wardle’s Three Identical Strangers does what scripted feature films cannot do and that even some of the best documentaries cannot or do not do. It takes you on a journey of discovery with the destination unknown – even to the director and the subjects. In this case, the subjects are Edward Galland, David Kellman and Robert Shafran who have a lot more in common than their names would suggest. When you see the three identical young men introduced in the film, the first of the mysteries and surprises in this multi-layered piece of investigative filmmaking will be revealed. Anything more would be a big spoiler, so do yourself a favour and try to go into the film knowing as little as possible. A bubbly, expressive Bobby Shafran, 56, sits in a chair facing the camera and tells us how he and Eddy Galland met. Bobby drove himself to Sullivan County Community College in Upstate New York in 1980 for his first day of college. ‘This wasn’t some institution of higher learning,’ he admits, and indeed the chances of meeting anyone he knew at this obscure, third-rate school were pretty slim. Eddy was not exactly there on the first day of school, having dropped out after his first year for reasons unexplained (but which become clearer as the film proceeds). He told his good friend Michael that he would not be coming back and no one expected him. And yet there he was – or was he? If the reunion of Bobby and Eddy makes the papers, it is nothing compared to the publicity after. A 100 miles or so away from the college, student David Kellman happens to see the euphoric twins in the news. To his surprise, they look at a lot like him. We later learn that there was a fourth brother, who died at birth. It is here that Wardle brings in the relatives of the three young men whose testimonies add to our astonishment. Here are three very different Jewish families living in different parts of New York who have suddenly been united with apparently joyful news. 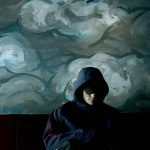 What is brilliant about Wardle’s editing and storytelling skills is that none of the talking heads give anything away so that when we first hear from the relatives, the initial excitement is on screen and everyone is on an emotional high. Anyone of a certain age might remember the huge publicity campaign (admittedly this would be more the case for Americans than those of other countries) surrounding the discovery, so relatively late in life, of 3 identical twins. They were on the cover of all the major newspapers and made so many television talk show appearances that the whole country knew the story. The young men capitalised on their celebrity by opening a successful restaurant together. Naturally, the restaurant was called Triplets. What no one will know is the follow-up to this human interest story. Wardle parcels out the complex information over the course of the film with such precision that he keeps us at the edge of our seat as though we were watching a mystery thriller. Although each of the brothers were brought up in a different social strata (working class, middle class, affluent), they had much in common, even sharing the same favourite colour. Like the brothers themselves at the time, we might be willing to consider it a coincidence that Edward. David and Bobby all have older sisters who are 21 even if this coincidence seems pretty weird. What begins as a joyous film about the astonishing reunion of three good-looking, loving and outgoing Jewish brothers gradually spirals deeper and deeper into a dark abyss. The real subject of the documentary becomes apparent about 30 minutes into the film, and Wardle films new talking heads – including the Pulitzer Prize winning investigative journalist, Lawrence Wright who started investigating the story in 1995 – still unsure of where the story was heading. As the trajectory of the journey changes, so do the genre and the style. The first half-hour has been middle-aged Bobby’s narration, along with archival footage and reconstruction, all in the past tense. This changes to what Wardle calls ‘present tense vérité or what we call in the UK, ‘actuality.’ Only a missing presence in the second part gives a hint of the how dark things will become. As with other great documentaries, including My Architect, Searching for Sugar Man and Tickled, the filmmaker does not know the ending when he began the film, and still does not have all the answers at the end. In some cases, this can prove frustrating, and here, despite a bit of repetition toward the end, it is understandable. New leads arrive before the filmmakers – and the living subjects – can digest them while some doors remain locked – until further notice.